Prof. Davis originated the idea for "From Where We Stand" to allow community members to tell their own stories and learn new skills directly from professionals. He has worked in newsrooms of all kinds and all sizes, as a manager, editor, writer and page designer. He was executive editor at the community newspaper in Chambersburg, Pa., for six years prior to joining the Newhouse faculty in 1999. Before that he was national editor and then Washington editor at USA Today, including one year as the lead editor directing the newspaper’s coverage of the Persian Gulf War. Ashley coordinates all aspects of production and day-to-day tasks for this project. She serves as director of The South Side Newspaper Project and runs the community newspaper The Stand. She is the main point person for interested contributors and works to coordinate all content seen on the website and in the print publication. She also coordinates additional community engagement projects for the S.I. Newhouse School of Public Communications. She started working for the project in 2009 overseeing the launch of the first print issue, planning of community workshops, obtaining nonprofit status for the project along with securing grants. She first arrived in Syracuse in 2000 to study journalism at the Newhouse School. While at Syracuse University, she wrote for several student-run publications and served as editor of the university’s only magazine devoted to diversity, 360 Degrees. Upon graduation, she took a full-time position with The Citizen, the daily newspaper based in Auburn, NY. As the paper’s features editor, she worked not only with staff writers but community members to provide local coverage of Cayuga County. Sponsoring Organization: South Side Newspaper Project, Inc. The vision for the South Side Newspaper Project — a community engagement initiative jointly run by the S.I. Newhouse School of Public Communications and the Southside Community Coalition — emerged in September of 2006 from a flash of serendipity. During the previous year, Prof. Steve Davis gave his advanced reporting class an assignment to create a newspaper focused on stories from Syracuse’s South Side. The result was an impressive 36-page publication that circulated the city and received positive feedback. Later, Davis contemplated creating a community newspaper that would be the work of South Side residents and students. By 2010 the project's first print issue came out. Today, we continue to produce an online news site and are on our 35th print edition. To incorporate stories by the community, the project offers community journalism workshops to train and motivate residents to produce content. 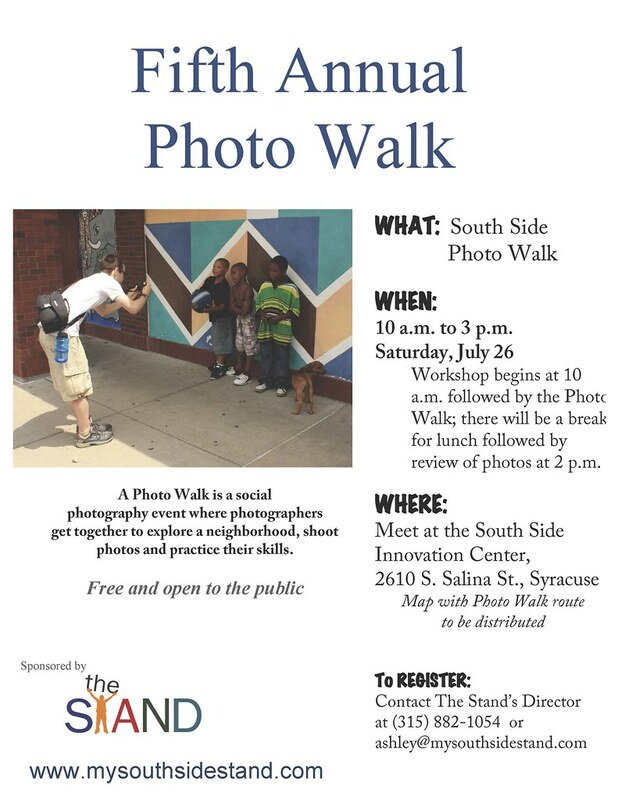 Workshops range from how to conduct an interview and cover an event to full-day news writing sessions where attendees are paired with a mentor to our most popular annual event, a Photo Walk through the South Side. And now in the summer of 2014, the project is pursing this intensive storytelling series: "From Where We Stand."